In an industry where only 1 in 3 clients are, on average, willing to recommend their primary firm to a friend or colleague, the value of checking in with your clients and candidates cannot be overstated. But where, and how, should your firm begin when designing a satisfaction survey initiative? And what steps can be taken to maximize the ROI of a survey program for your team, clients, candidates, and even prospects? 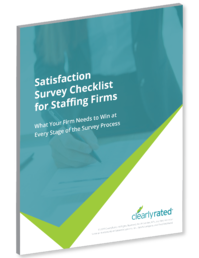 ClearlyRated has compiled this checklist asset to help your team build an execution roadmap, avoid common survey pitfalls, and make sure you gain the most valuable insights possible from your client and talent survey initiative.